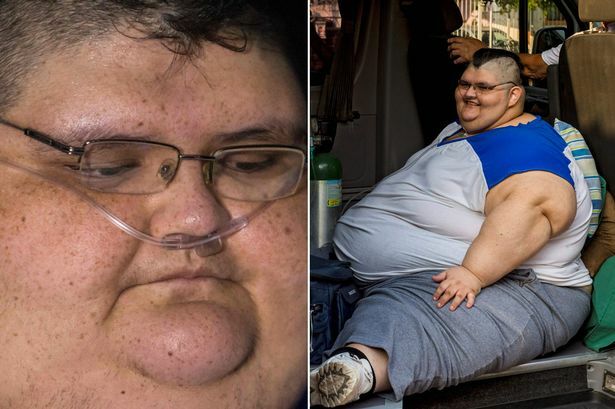 The world's fattest man is preparing for life-saving gastric bypass surgery after spending nearly seven years confined to a bed. Juan Pedro Franco, who once weighed more than half a ton, has lost a whopping 27 and a half stone to go under the knife. The 32-year-old, from Aguascalientes in Mexico, has been on a three-month diet to prepare for the operation on Tuesday. He will go through a series of intense tests, with his blood, imaging, pulmonary and cardiac function studied by a team of doctors. Doctors hope the surgery will help Juan walk again - after being confined to his bed for nearly seven years. Dr Jose Antonio Castaneda Cruz said: "He has lost nearly 30 per cent of his initial weight, so he is ready to undergo the bariatric surgery." Juan discovered in November that he was actually 15 stone heavier than doctors first thought. Doctors believed he weighed nearly 79 stone when he was taken to hospital earlier that month for surgery. But tests showed his true weight to be 92 stone 9lbs- just over a stone short of record-breaking compatriot Manuel Uribe who reached a peak weight of 94 stone before dying in May 2014.